Hello, spring and hello, sunshine! The time has come to shed our winter layers. We’re trading in our pile-lined coats for light-wash denim jackets and our sweatsuits for skirts and dresses. We’re also going to start filling up that planner again with actual plans that require leaving the house. With weddings, barbecues, graduation parties and picnics in our near future, we’ll be needing something fresher than previous years’ leftovers to wear for photos and floating around dance floors. Running out of time? Don’t worry, because our new favorite party dress is right here! Shop With Us: Put Some Spring in Your Step With These Colorful Nike Sneakers on Sale for Under $50! See it: Get the Calvin Klein Floral-Print High-Low Wrap Maxi Dress for just $129 at Macy’s! This dress is faux-wrap style, with a surplice neckline forming a V. This style helps to create shape at the waist, flaring out slightly for a flattering effect that’s breezy and carefree. The skirt has a high-low hem, the front of which hits below the knee and the back of which hits toward the bottom of the calf. The hem ruffles and drapes with almost an accidental ease, but we know there’s nothing accidental about it. This is a Calvin Klein dress we’re talking about, after all. 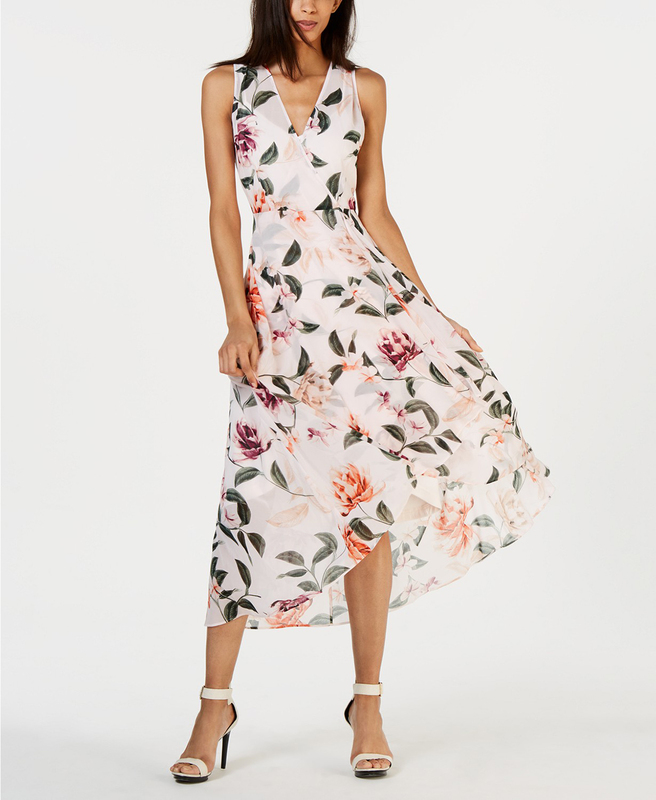 This floral dress is lined, so we can forget about layering bunching-up slips or long shorts underneath. In the back it has a zipper closure, which camouflages into the pattern. There is a narrow keyhole detail reaching from the top of the back toward the bottom of the shoulder blades, adding in an unexpected yet sophisticated accent. Keyholes are the key to our heart. Time to talk colors! These prints are so gorgeous, we don’t even know which one to start with, so we’ll blindly choose. And . . . Blush Floral! This option is a very light pink with flowers spread throughout for a garden-chic aesthetic that almost has Us reaching for long white gloves and a royal wedding-style hat. Unless the occasion calls for it, though, we’ll probably stick with white or silvery heels and a pearly hair clip. There are two cream shades with two totally different styles: one with a black floral print and one with a multicolor floral print. These dresses both look like they were painted in a watercolor style. The multicolor version features pastel purple flowers with accents of pink and faded orange, while the black version keeps things classically monochrome. The last shade is Black, which features similarly colored flowers as the multicolor cream shade, but the result is a totally different look because of the dark base shade. A pair of black heels or even colorful shoes to match the flowers would work flawlessly here. This shade is selling out, so act quickly! 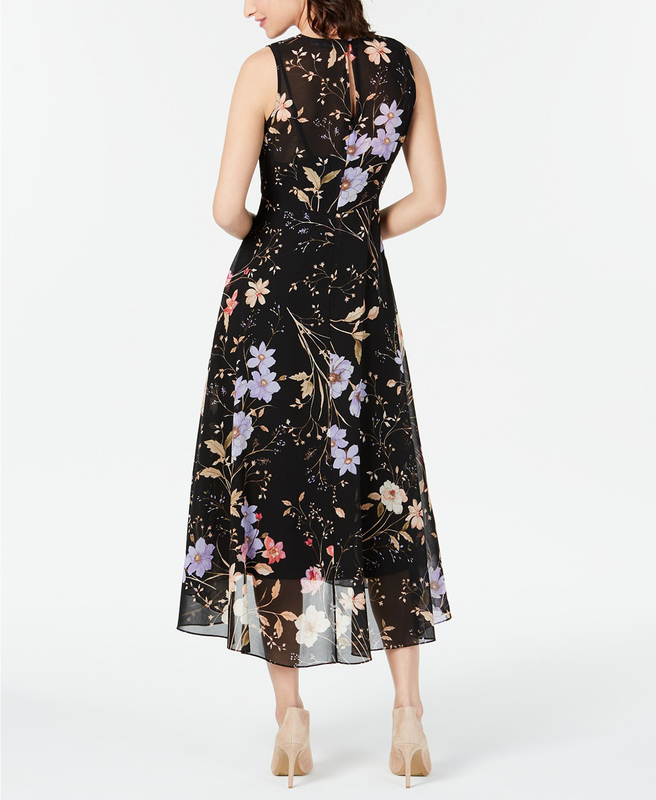 We can practically hear the compliments pouring in already when we wear this dress for the first (and second, and third) time. All we need to do is put it on! Not your style? Check out more from Calvin Klein here, and explore other dresses available at Macy’s here!